I hope it will be sunny tomorrow! I hope it’s not raining tomorrow. I hope for good weather tomorrow. I hope my presentation answered your questions. I hope against hope that she will still be there. I hope someone finds my phone. I hope you like my gift. It looks like it’s going to rain. I hope not though. I don’t think I’m busy tomorrow, or at least I hope not. The in-laws said they were visiting us this weekend. I sure hope not. I hope I’m not busy tomorrow. I hope you are having a good time with your friends! I hope you’ll enjoy your trip! – Is it payday today? – I’ll do everything to make it up to you! 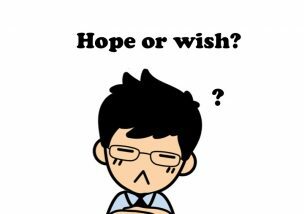 – I certainly/really/sure hope so! – I hope we can get good seats. – I hope so too! – Do you think she forgot the appointment? – Do you think our boss is angry? – I certainly/really/sure hope not! I mentioned your name to my boss. I hope you don’t mind. I hope you don’t mind me asking. Where are you from? I hope I’m not disturbing you. I hope I didn’t offend you with my comment. I hope I’m not interrupting/intruding. I hope you’re not thinking about seeing him again. I hope you’re not driving today. The traffic is terrible! I hope you don’t intend to invest in stocks right now. I hope you don’t get in trouble! Are you calling him? I really hope not! I’m hoping to get my licence this year. I’m hoping to finish this book by the end the week. I’m hoping for good weather tomorrow. I’m hoping for a better salary next year. I’m hoping that my car gets repaired by the end of the week. I’m hoping that we’ll be able to get the presentation ready by tomorrow.